igGrid Overview: This topic explains how to add igGrid to a web page. igGrid/igDataSource Architecture Overview: This topic explains the inner workings of igGrid and how it collaborates with igDataSource to enable binding to different data sources. Note: When you try to get the grid columns by using the API $(“.selector”).igGrid(“option”, “columns”) you will get the flat view of the actual data columns. If you want to get the actual column hierarchy of multi-column headers you should use getMultiColumnHeaders method. 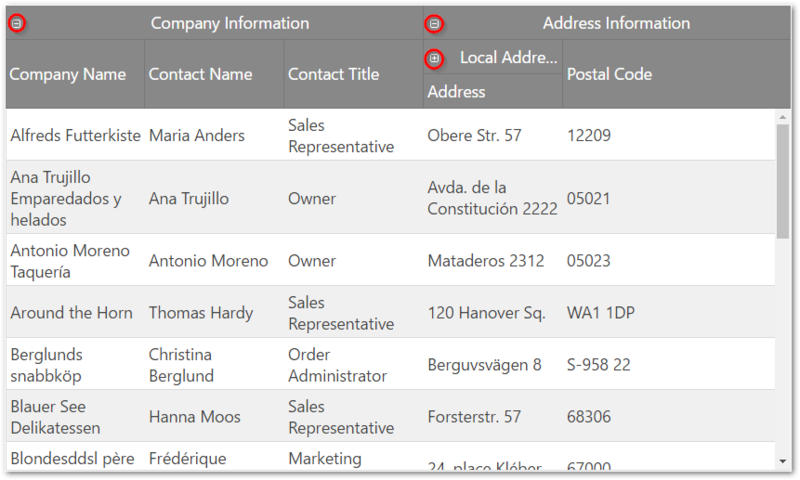 Collapsible Column Groups is a part of the multi-column headers feature which provides a way to collapse/expand a column group to a smaller set of data. A column group usually consists of two or more columns. When a column group is collapsed, a subset of the columns will be shown to the end-user. This subset can be one or more of the previously shown columns, or an entirely new set of columns. Each collapsed/expanded column can be bound to the data source of the grid, or it may be unbound, thus calculated. A group can be expanded/collapsed by clicking on its expand/collapse header indicator. This functionality can be controlled by manipulating the expanded, allowGroupCollapsing and hidden properties of the groupOptions object. group: If a column has a group property this column is a group column and it’s not bound to data from the data source. Parent columns are for display purposes only, i.e. they are rendered only in the THEAD of the grid. groupOptions: The options of the group. groupOptions.expanded: Makes the group expanded or collapsed. This property is applied only if we have allowGroupCollapsing enabled. groupOptions.allowGroupCollapsing: Allows to collapse/expand a group and makes expansion indicators visible in the group header. groupOptions.hidden: Controls when should the group be hidden. This property is applied only if we have allowGroupCollapsing enabled. There are four options for group hiding: never , always, when the parent group is collapsed and when the parent group is expanded. headerText: The caption of the column. 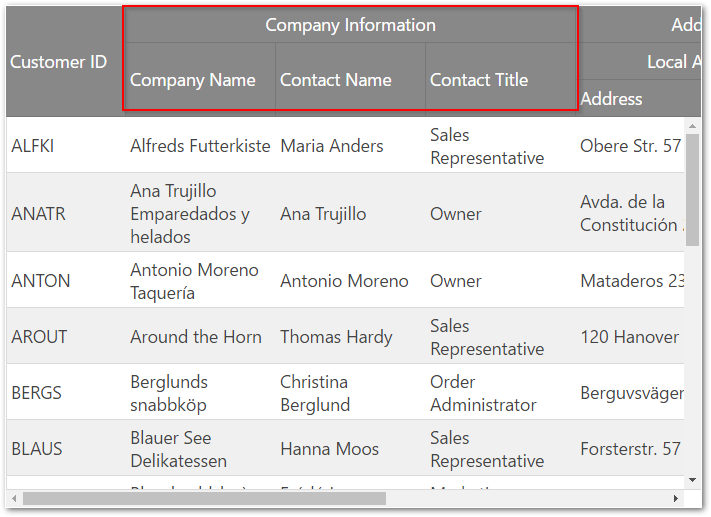 key: Group columns accept a key property whose value is used as an identifier when the multi-column headers feature is used in combination with other features. For example, use the key of the group column to initially hide the group. However, the value of the key property should not be a column key from the data source. If the key is not specified, then it is generated automatically. Each key value must be unique in the columns array. rowspan: Allows you to modify the rowspan attribute of the table header cell. hidden: You can use the hidden property to initially hide a group column. Hiding Through the API you can hide a column group or individual columns by using the key property. Note: The hiding feature is not integrated with multi-column headers with enabled collapsible column groups. Resizing In code you can allow resizing only for table header cells. You cannot disable column groups from the resizing feature’s columnSettings. ColumnMoving In code, you can allow moving of column groups or individual columns by using their key property. Users can move both column group or individual column, but the moving is only within the same level (user can re-arrange only sibling columns). For example an individual column cannot be moved between column groups or in a parent group. Configure Multi-Column Headers (igGrid): This topic walks you through configuring multi-column headers in igGrid. Configure Column Hiding: This topic explains how to configure the columns of the igGrid control in code. Column Resizing (igGrid): This topic explains the column resizing functionality of the igGrid control. Collapsible Multi-Column Headers: This sample shows how to configure collapsible multi-column headers.